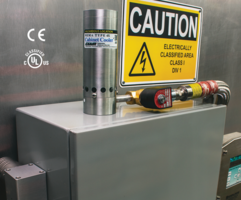 Reversible Drum Vacuums carry CE compliance. Suited for recovery of coolant, hydraulic oils, sludge and chips, waste water, and liquid spills, Reversible and High Lift Reversible Drum Vacs™Â are powered by compressed air and feature solid-state construction for maintenance-free operation. Reversible Drum Vac's vacuum produces 96 in.Â H2O of vacuum and can fillÂ 55 gal drum in 90 sec, while High Lift version produces 180 in.Â H2O of vacuum and lifts liquid up to 15 ft. 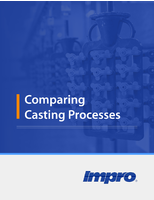 Both versions attach to any closed head 30, 55, or 110 gal drum. 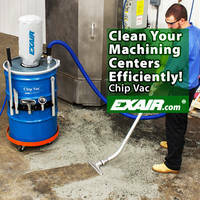 EXAIR's Reversible Drum Vac and High Lift Reversible Drum Vac are ideal for the recovery of fluids like: coolant, hydraulic oils, sludge and chips, waste water, and liquid spills. 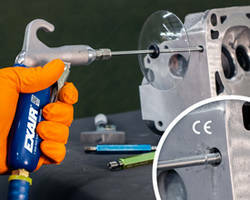 After undergoing rigorous testing by an independent laboratory, EXAIR's Reversible Drum Vacs™ have been proven to meet the stringent requirements of the European Union in order to be marked as CE compliant. The standard Reversible Drum Vac's high powered vacuum produces 96" H2O of vacuum and can fill a 55 gallon drum in just 90 seconds, with the turn of a knob, the same stainless steel pump can quickly empty the drum. The High Lift Reversible Drum Vac is perfect for pits, below grade coolant sumps, deep wells or bulk storage tanks which require a longer vacuum hose and more power. 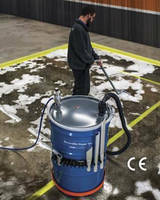 The High Lift Reversible Drum Vac produces 180" H2O of vacuum and lifts liquid up to 15'. Since the Reversible Drum Vacs are powered by compressed air, they have no electric motor to wear out and no impellers to clog. In fact, the Reversible Drum Vacs have no moving parts, assuring maintenance free operation. Both Reversible Drum Vacs attach quickly to any closed head 30, 55 or 110 gallon drum. 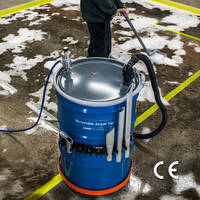 For small jobs, a 5 gallon Mini Reversible Drum Vac System is also available (drum included, standard unit only). 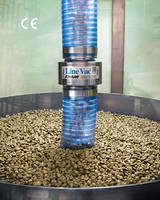 Reversible Drum Vac Systems include the two-way pump assembly, flexible vacuum hose (1-1/2"/38mm I.D.) with 90 degree quick release elbow connection and one aluminum wand. Deluxe Systems add a drum dolly, heavy duty aluminum tools and tool holder. 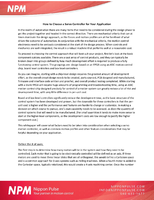 Premium Systems add a 30, 55 or 110 gallon drum. Prices start at $489.